International Sales Expert and Author Tom Abbott is Back in Manila for the 2nd Sales Leadership Masterclass! 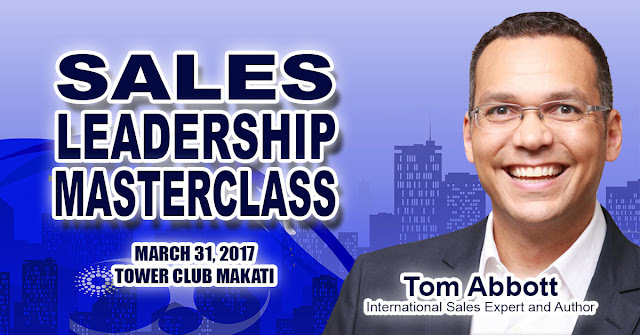 Pasig City (February 27, 2017) – International Sales Expert and Author Tom Abbott is back in Manila for the second Sales Leadership Masterclass which will be held at the Tower Club in Makati this March. With his decade-old experience in selling, Tom Abbott will be helping sales teams to overcome day-to-day challenges and find their own solutions to achieve its full potential, hit targets and get ahead of the competition. The one-day workshop will have discussions such as the difference of Sales Leadership, Sales Management and Sales Coaching; the eight (8) different styles of leadership and what really works; tips and strategies on how to motivate and incentivize sales teams, review each staff’s performance appropriately; master sales interview questions; discover the power selling assets sales teams need; and building a high-performance sales culture. The Sales Leadership Masterclass is open for Business Leaders, Business Owners, Sales Managers, members of the Academe, and professionals who wants to develop their skills to become an effective sales leader. The Sales Leadership Masterclass will be held at the Tower Club Makati this Friday, March 31, 2017. Reserve your seat by calling Ex-Link at (02) 633-0153 0r 643-3887, SMS 0920-981-4376 or email info@exlinkevents.com.